As with many of the manufacturers attending MWC 2014 this year, Acer has jumped the gun and announced the new smartphones it'll be bringing to the show. 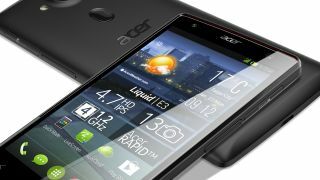 It has launched the Acer Liquid E3 and the Liquid Z4, both of which sport low price tags and half decent spec sheets. First up is the Liquid E3 which boasts a 4.7-inch HD display (that's 720p rather than 1080p), 1.2GHz quad-core processor, 1GB of RAM, 4GB of internal storage, microSD slot, 13MP rear camera and 2MP front facing snapper with LED flash for selfies. That's not a bad package considering Acer is quoting €199 (around £165) for the Liquid E3, which will launch with Android 4.2.2 in April, but an Android KitKat update is confirmed for later in the year. The Acer Liquid Z4 is even cheaper, coming in at €99 (around £80), and features a 4-inch display, 1.3GHz dual-core processor, 4GB of internal storage, 5MP rear camera and Android 4.2.2 Jelly Bean. The Liquid Z4 release date is also marked as April, and it'll be available in black and white.